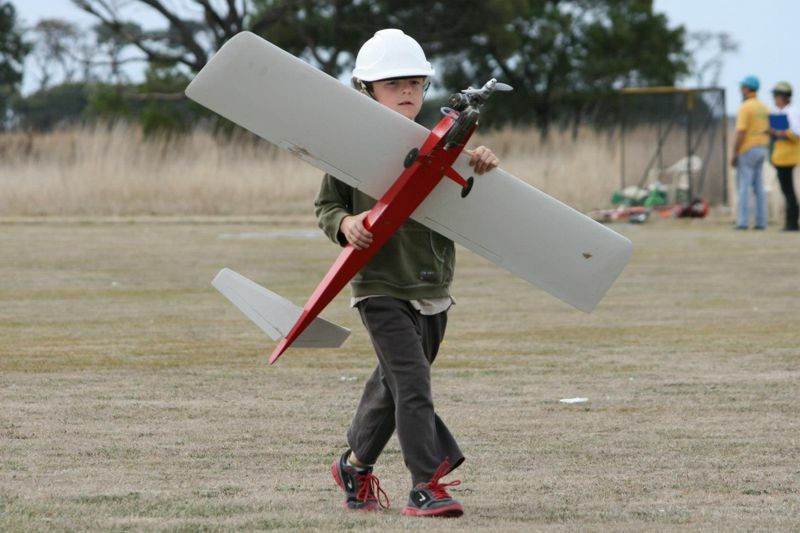 The third VMPRA event for 2013 was held at the Warrnambool Model Aircraft Club’s field in Koroit, Victoria. The field was in excellent condition and had been well groomed by the host club. Contestants began arriving on Friday afternoon and a large contingent set up camp at the field. Those that arrived early enjoyed excellent weather conditions for testing and practice. 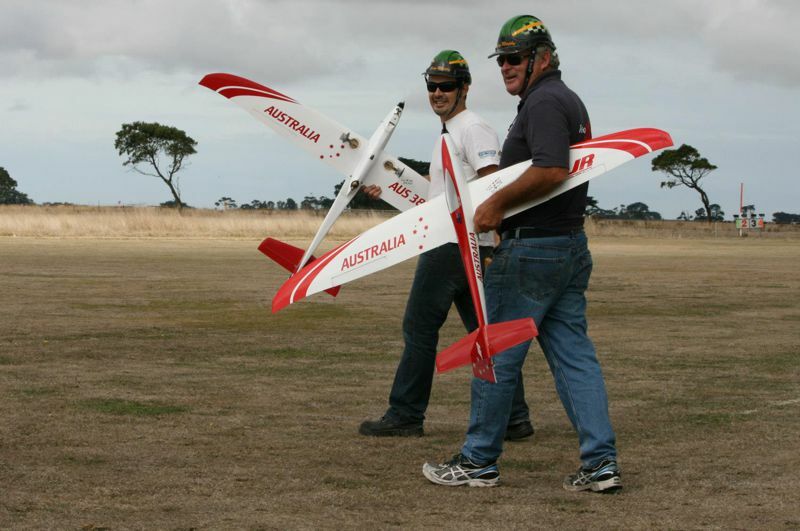 Three classes were scheduled to be flown – Q500 Sport, VIC F400 and FA1, the Australian version of FAI. Per usual VMPRA practice, the racing was held over 10 ½ laps of the FAI course. This reduces the requirements for the number of course workers as the cut judges at the No1 Pylon also serve as the timers. Q500 Sport and VIC F400 were scheduled for Saturday morning. Q500 attracted six entries and VIC F400 attracted 5 entries. Beau Murphy also flew an F5D. Three rounds of these classes were completed before the weather conditions deteriorated and racing was called off for the day. At the end of three rounds, James Hurley was setting the pace in Q500 Sport. David Axon had entered the fray and was running in second place – under the guidance of Bryan Steele, with maintenance support from Jim Orenshaw. James’ arch rivals – John Schmidli and Daniel Arapakis suffered 200s. Matt Carter obliterated his model when it came in contact with the ground. In VIC F400, Glenn Matthews lead the way with his new Nelson LS powered Supercat. He was followed by Andrew Davies and Gary Davidson. These proved to be the final placings for this class as there was not sufficient time to complete any additional rounds on Sunday. Sunday dawned with misty rain and low cloud cover, which delayed the start. However, once the weather improved racing got underway with eight additional rounds of Q500 Sport and eight rounds of FA1 being completed. The racing action in Q500 Sport became more intense on Sunday and times dropped significantly as conditions were much better than the day before. At the end of 11 rounds of racing Daniel Arapakis was comfortably in first place. His best time was 90.85 seconds, which is very impressive for this class. John Schmidli was in second place and Davis Axon was in third place – having improved his race times by over 20 seconds! The initial pace in FA1 was fairly conservative, as re-tuning seemed to be in order for some contestants due to the significant change in the weather conditions. However, by Round Four the pace was picking up and the weather conditions had stabilised. Eight rounds were run before time and daylight were starting to run out. When the scores were tallied Tom Wetherill was in first place. Andrew Davies finished second – a good return to form with a fresh engine. Glenn Matthews finished in third place, posting some good times along the way. The fastest time in FA1 was a 58.5 (for 10 ½ laps) that was posted by Beau Murphy. The scores for the other competitors in FA1 were hampered by a few too many 200’s. The Warrnambool event proved to be a great competition and VMPRA extends it thanks to the host club for allowing use of the field, providing workers to help man the course and for keeping everyone well fed during the weekend. This weekend was not so good for team Murphy with both Barry & Beau having issues. Very uncharacteristic for them. There was smaller numbers than usual particularly with James Hurley & myself not having a model to fly in this event. 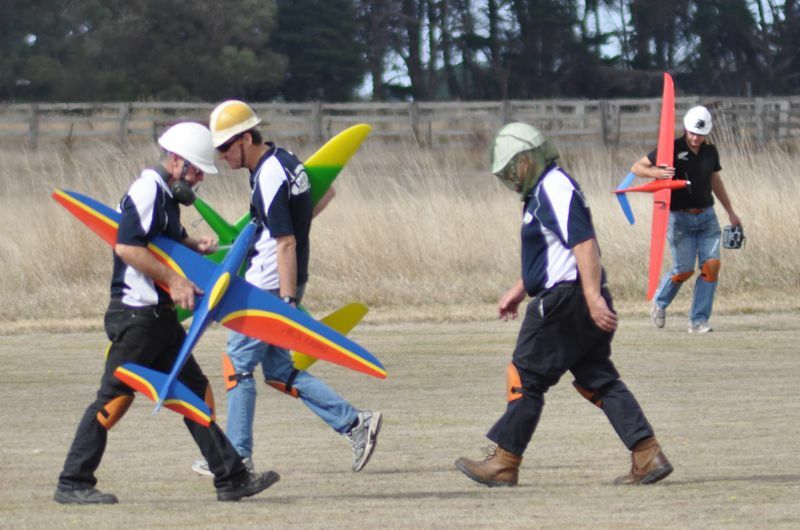 Tom Wetherill had an mishap when landing his Loki and broke the fuselage. 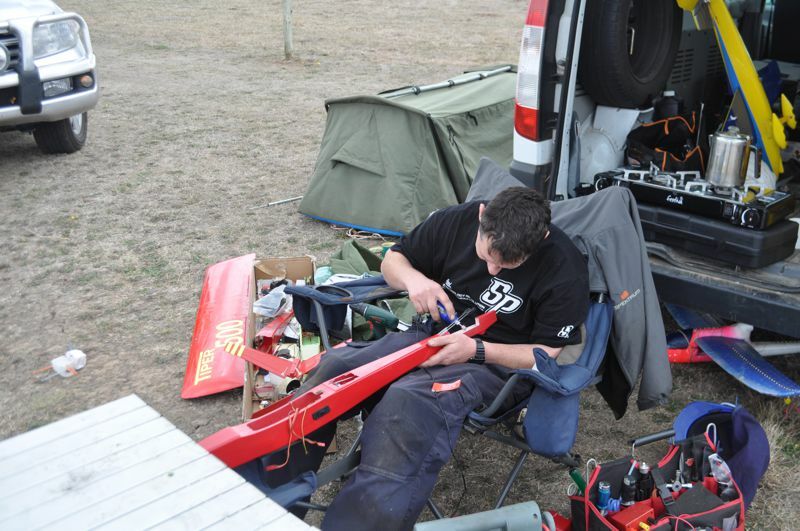 And Matt sat there working all afternoon until he had a plane to fly for the next day! Another good turn-out for Q500 with David Axon joining in the fun. With the exception of a mishap with one of his models throwing a prop blade and being uncontrollable and going in, he had another model which flew well and he really improved his flying with the help of Brian Steel (shouting at him – David’s word) who was calling for him. David kept achieving new personal bests and ended up with 3rd place. There was some good scrapps between myself and Daniel Arapakis with both of us getting new personal bests. 90.85 & 92.98 respectively. At this rate Daniel will be sub 90 seconds before long! The championship table has been updated and there is also a photo gallery from this event. FA1 – Tom Wetherill still leads but Glenn Matthews move up to second place and Beau Murphy move done to 3rd. F400 – No change in the top 3 positions, but the points are close between Tom Wetherill, Jim Orenshaw & Andrew Davies so anything could happen at the next event. Q500 – No change in the top 3 positions but James Hurley has drop away from the top by 4 points. There is 1 more event for FA1 & F400 & 2 more for Q500. The next year’s championship starts at the July 13-14 event at Bendigo so it’s now time to prepare and plan your assault on this title for your favoured class/es. 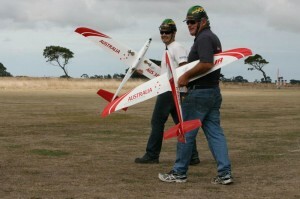 The next event is a 1 day comp at Werribee flying Q500, EF-1 & Sports. The 1 day, introductory class races are the perfect event for coming along and trying pylon racing. There will be plenty of people on hand to assist you. You don’t need to have a special model. A 46 size trainer or low wing aircraft would be a fine model to start flying pylon. EF-1 (Electric Formula 1) is a popular electric pylon racing class overseas. 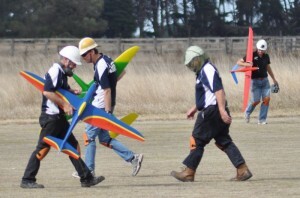 The planes are ARF models of full size formula 1 pylon racers. If you are into the electric models and want to race, this is your chance. Bought a new Viper and ready to try racing it, come along to Werribee! Also coming up is this year’s AMPRA event. This is a national pylon event and it’s being held here in Victoria, so there will be a lot of flyers from interstate. This is the big event for the year. Check the calendar for details.